You can build your own shelves. Separate them as you see fit to organize your collection. When your NOOK Tablet arrives, it includes just one shelf: Favorites. But you can add shelves to hold your vast collection of For Dummies eBooks, a few dozen of your favorite fiction titles, and a special place for your cookbooks. In My Library, tap My Stuff. Tap Create a New Shelf. Type a name for the shelf. Highlight a book in the list of items in your Library. Tap Place On or Remove From Shelf. 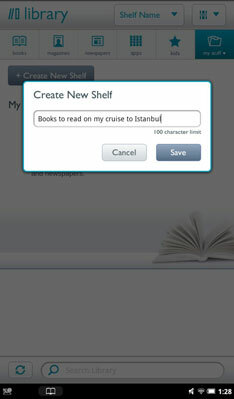 You can rename a previously created shelf by tapping Rename a Shelf on the touchscreen. To remove a shelf, tap Remove a Shelf; tap OK to confirm. In some rare cases you may need to unlock a book or periodical that you bought through Barnes & Noble and that’s protected using Digital Rights Management (DRM). In that case just enter your name, the e-mail address associated with the B&N account, and the credit card number that you used to make the purchase.